The Single Bay Fishing Rod Holder is one of the individual bays used in both the Triple Bay Box and the Triple Bay Flat rod holders. The Single Bay fishing rod holder is sold without hardware since there are so many different ways it can be used, but our T-Knob Hardware Kit may be purchased to attach the Single Bay rod holder to pontoon railings. They will hold rods of all types and sizes. They are perfect for still fishing or for trolling. Form molded out of high-density polyethylene (HDPE), they can withstand temperatures ranging from -148 degrees up to 230 degrees. They are harder, stronger, and safer than PVC and resists stains from solvents and chemicals. The Single Bay fishing rod holder is perfect for spots where the Triple Bay Box or the Triple Bay Flat will not fit, such as on the railing of a pontoon boat door or a short railing. They can be staggered on dock or pier railings using a bolt from underneath and a washer above the rod holder and a wing nut to tighten. To avoid corrosion, please use stainless steel hardware; or purchase our T-Knob Hardware Kit to attach the Single Bay rod holder to pontoon railings where the Triple Bay Box rod holder will not fit. See photos for examples. All of our fishing rod holders come with a limited lifetime warranty. This means that the product will be free from defects in materials and workmanship for the lifetime of the product to the original end user. 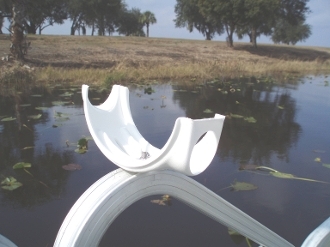 Our fishing rod holders are available in multiple styles for various applications.